Is Professional Teeth in NYC Whitening Really Worth it? Your morning coffee and favorite red wine are changing the color of your teeth. A bright white smile is essential to life now that social media has everyone snapping pictures on a daily basis. The demand to keep personal social media accounts up to date has consumers rushing towards any teeth whitening treatment they can access. Generally, consumers tend to begin their teeth whitening journey with DIY treatments. The DIY path usually starts with a teeth whitening toothpaste and mouthwash then leads to a whitening pen, and strips. Some consumers find themselves in the middle of a mall getting their teeth whitened as onlookers stare at the procedure. To schedule your Zoom! Teeth Whitening in NYC, please call 212-972-3522 or fill out the contact form to get started today! You may also visit our office at 30 East 40th St @ Park Avenue, New York, NY 10016. A common reason consumers start with DIY treatments is due to the lack of coverage for teeth whitening procedures. Insurance companies consider teeth whitening cosmetic and often don’t offer any coverage. The dental industry has acknowledged the situation with insurance companies and often provide their patients with a variety of ways to pay for their teeth whitening treatment. Some dental offices even offer convenient finance plans. Professional teeth whitening is always the best avenue to take when keeping your smile bright on a continuous basis. Dentists have access to teeth whitening treatments in higher dosages than the standard over the counter whitening treatments. Higher amounts of hydrogen peroxide and carbamide are found in almost all dental office whitening treatments. This powerful combination that makes teeth white is not available to the public. Yes. 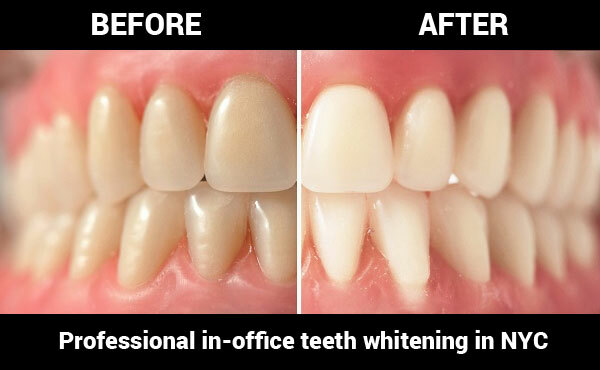 Professional teeth whitening is worth it because it comes with the guidance of a professional and allows consumers access to high-quality treatment and follow up visits. One of the most common complaints from consumers that use over the counter products is teeth sensitivity. Consumers use the whitening treatment, and it works well, but a few days or weeks later they realize they can’t consume cold or hot foods without experiencing pain and sensitivity in their teeth. Consumers that experience teeth sensitivity need to stop over the counter treatment immediately and seek advice from a professional. Consumers that spend a little extra money at a dentist office in the beginning for their teeth whitening treatment often realize it balances out in the end. Teeth whitening is an ongoing process since consumers need to continue to eat and drink, which are the leading cause of discoloration. This means DIY treatments and products need to be purchased more often and applied frequently compared to a one hour or less office treatment. Dentists examine the overall health of the patient’s gums and teeth. They offer a variety of options that are best suited for the patient. This also gives the patient the opportunity for a follow-up visit if teeth sensitivity is experienced. The next treatment session can be changed to lessen the sensitivity. Unfortunately, over the counter teeth whitening treatment is a “one size fits all” deal which means all consumers purchasing the product receive the same amount of whitening strength. >> Should You get Your Teeth Straightened at a NY Strip Mall?